The situation in Japan seems to be getting a lot worse before it gets better. Though the earthquake and tsunami are long over, radiation leaks and problems continue at the Fukushima Nuclear plant. According to SocialIntensity.org, there have been more than 500 million tweets about the incident in the last month. 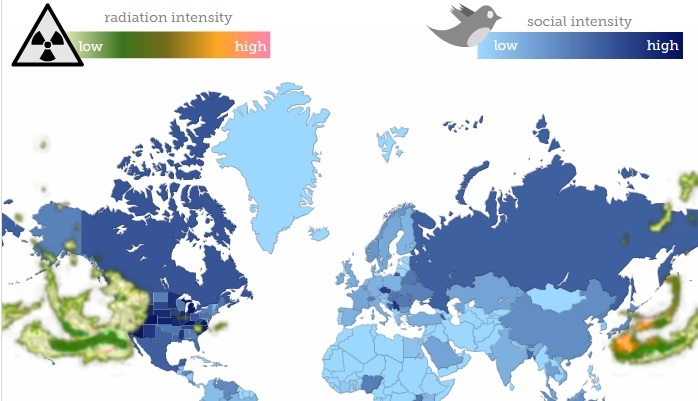 The moving graphic below shows the intensity of tweets in each country around the world in the days since March 11, 2011, when the nuclear reactor first blew its lid. It’s interesting to note how much tweets pick up as the cloud approaches them, and how much they decline after it passes. To get this data, the site used Google’s Realtime system to search for tweets containing information on radioactivity, pollution cloud, Fukushima, and similar topics. Fukushima is now the most expensive natural disaster in history, costing more than $309 billion dollars. The disaster is getting so bad that Sony may shut down its offices for two weeks to save power.